We get a lot of questions regarding lawn mower maintenance, and so we’ve put together this series of articles to address the most common gas-powered, lawn mower maintenance needs. If you follow these steps, you’re sure to increase the longevity and efficiency of your mower. In fact, performing these tasks is a great start to troubleshoot a lawn mower that isn’t working. Click through the link in each step to see the full explanation including pictures. Editors note: This article was originally published in October of 2009. The fall is an excellent time to perform these regular maintenance tasks, but we understand that a lot of people won’t make this a priority until the spring. That’s why we’re re-publishing this article now so it’s readily available when you uncover your mower for the first time this year. With Fall comes an excellent time to maintain your lawnmower. While most would put off this activity for the Spring, by doing it now, you’ll be ready to fire up that mower first thing next cutting season… Imagine the feeling of heading out to your garage or shed, adding gas, and starting up a mower that’s ready to rock. Here’s the few steps you can take now to get a jump on next Season (with links to articles explaining each step in detail). Maintenance should take you less than an hour after you pick-up the necessary parts (oil, spark plug, and air filter, and potentially a new blade). The only significant tool is a grinder, which you’ll either need to purchase or borrow from a friend. Step 1: Change the Lawnmower’s Oil. During regular use, the oil will get dirty. By changing the oil at least once per season, you’ll prolong the mower’s life by years. Total time: 20 minutes. Step 2: Change the Lawnmower’s Air Filter. Perhaps even more important than the oil is the air filter. Lawnmower air filters can get extremely dirty over time as they are constantly filtering lawn clipping debris. Total time: 5 minutes. Step 3: Change the Lawn Mower’s Spark Plug. You may only need to perform this step once every 2-3 years, depending on use. Check the spark plug for wear. If needed, replace the plug to keep the engine running in top condition. Total time: 5 minutes. Step 4: Sharpen or Replace the Lawnmower’s Blade. More than any other maintenance task, sharpening your lawnmower’s blade will bring new life to the lawnmower. 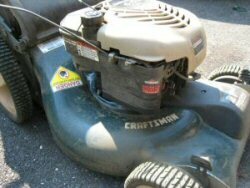 It’ll cut faster and more evenly, and make the lawnmower perform like new. Total time: 20 minutes. Before you put the lawnmower away for the Winter, you’ve got two options for the remaining gas: either run the lawnmower out of gas, or add a gas life extender. Most gasolines break down and aren’t usable after 6 months. Even if they do run when you start-up the engine, you run the risk of gumming up the components with poor-performing gas. Our choice each year is to run it out of gas. For life extenders, you can check the local home improvement big box or an auto parts store. What do you think? Will you maintain your lawnmower this Fall, or put the job off for another 5 months? The leaves are just starting to appear en masse at This D*mn House but you can bet that by Thanksgiving I will have drained the oil and run the mower’s engine of its gas supply. What perfect timing. I was just at my local lawnmower shop yesterday picking up a new primer bulb for my 10 y/o Lawn-Boy. Also got quotes on blade sharpening vs replacement. The mower runs on a gas/oil mix so no oil to change or drain & the air filter is just a sponge so I clean & reuse it. Didn’t think about the spark plug (Oops). Thanks for the reminder! And I’m bad about leaving gas in my mower over the winter so I’ll make sure I run it out this year. You can usually get at least 2-3 good sharpenings out of a single blade. Our soil is rocky so I end up with a dull blade pretty quickly. This year may very well end up a replacement for us. Glad you liked the article. The mower series is one of my favorites. Hate to waste fuel but I also prefer to just run out the gas. Feel better about storing an empty tank and getting a fresh start in the spring. Great tips on maintenance! Thanks, Tim – we do the same – run it out… usually try to optimize is though – put in only enough gas for the last mow. I will definitely be coming back to this since our lawn mower is the same (craftsman) just different engines. Need to do all of these! I just did this to all of my mowers. Unfortunately, the owner of my riding lawnmower before me didn’t follow these steps so closely (left old gas in it for quite some time) Which required me to rip the carb. off and give it a good cleaning. The winterization would have saved me a lot of trouble. Good advice and it doesn’t apply to just lawn mowers. I know a lot of people who find themselves having to pay a fortune in December because their furnace clunked out. There’s no law that says you cannot fire it up on a cool September evening to see how it’s running. If it’s broke, it will still be broke in three months but that’s three more months you have to save the $$ to replace it. I usually just get non-oxygenated fuel. We have a ton of stations in MN that have at least one pump of 91 without ethanol that’s marked for boats and small engines. My snowmobile knocks (and retards the timing) if I run anything less than 91. We had one station that sold gas w/o ethanol, but they have switched over as well. I can’t remember the reason they gave, but I think it was a city or maybe even a State of Texas regulation. I haven’t tried these… But I have been running 10% ethanol fuel through my lawnmower forever and I’ve never had a problem with it… I know of no one adding these additives to prolong the life of their equipment…. My gut tells me they are a waste of money… I’m no fan of ethanol fuels, but that’s a different discussion. I don’t change my lawnmower’s oil often, but I do check it often. If it’s still gold and translucent, I don’t change it. If the lawnmower were new, I’d change it often until it had hit the break in point. Manufacturers do have a schedule of maintenance based upon hours of use, though. Someone mowing a quarter acre isn’t going to put the hours on their machine that someone cutting an acre with a self-propelled mower will. When it comes to running a mower out of fuel at the end of the season, don’t waste the gas. If the fuel line has an inline shutoff, close it, start the mower, and run it for the few seconds it takes to run dry. Then dump the remaining fuel into the can, and put that in your vehicle. Also drain the carb in case unburned fuel is still in there. Don’t want to gum that bad boy up. Good tips, William. I usually time it pretty well to run out of fuel without waste… but that’s because my lawn is exactly 1 tank full (just about). So last night I decided to add a new air filter and spark plug to a mower my father gave me. It went from a 12 pull start, to a 1 pull start. Going to change the oil today and enjoy it the rest of the summer! Thanks Fred! I’m going to share this article with Andrew since we just got a lawn mower for our new house. Great advice for getting the mower ready for winter since this will probably be the last weekend or so of mowing! I’m really glad to have run across this article! I made sure I timed it right at the end of last season to have an empty fuel tank, but I need to change the oil and air filter before mowing season! Thanks for the reminder and great advice! I pick up small sticks before I mow, thinking it will improve blade performance over time. I’ve also heard that one should never cut more than 1/3 of the height of grass off for the health of the grass, and as a means to prevent weeds from coming up. Blade sharpening done properly results in a balanced blade, so I have it done elsewhere, or buy a new blade. I always love the area of getting back into the garden and working on the lawn. I seem to be really een for the first month of spring and then I get side tracked and my attention turns elsewhere. So this year I have decided to rip up the lawn and make a resined patio area. I only have a small square garden but I think its perfect for a barbecue area with a nice set of tables and chair and a lovely place for a summer garden party.